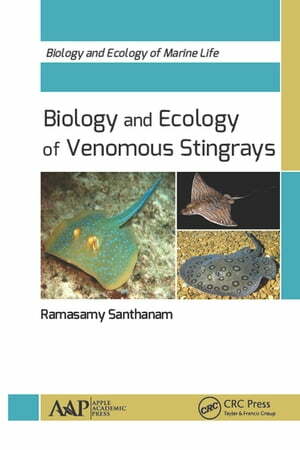 Collins Booksellers - Biology and Ecology of Venomous Stingrays by Ramasamy Santhanam, 9781351800259. Buy this book online. This comprehensive book provides first-hand information on the diversity, biology, and ecology of venomous stingrays of freshwater, brackish, and marine ecosystems. Each year thousands of injuries to swimmers and surfers are reported, with 750 to 1,500 stingray injuries reported each year in the US alone. As more vacationers spend their leisure time exploring coasts and tropical reefs, often in isolated areas without immediate access to advanced health care, there will be greater potential for stingray injuries. A thorough understanding about the diversity of stingrays of marine and freshwater ecosystems and their injuries and envenomations would largely improve the public health community’s ability to better manage and to prevent stingray injuries. This volume fills that gap. With over 200 photos and illustrations, this book shows the characteristics of venomous stingray families along with other profile information, such as common name, geographical distribution, diagnostic features, reproduction, predators, parasites, the International Union for Conservation of Nature’s conservation status. Importantly, it includes valuable information on stingray injuries, envenomation, and medical management.